SINGAPORE'S best-known tech company, Creative Technology, is targeting its new Sound Blaster I system at the fast-growing smartphone and tablet market. Creative's co-founder and chief executive Sim Wong Hoo is predicting that the new Sound BlasterAxx is on the cusp of a new growth period. "We're at the same point as when we launched the first Sound Blaster 23 years ago. We're excited about it because the market opportunities are huge," he said at a product demonstration to the media and"business pattners yesterday at its headquarters in Jurong. Globally, about 73 million tablets were sold last year, a figure expected to rise to about 383 million by 2017, according to research firm NPD DisplaySearch. Last year, 491.4 million smartphones were sold, said research company IDC. The number is setto rise to 982 million by 2015. The Sound BlasterAxx could revive Creative's flagging fortunes, which saw its share price sink to below $2.50 last year. Any financial impact, however, will. be feIt only in its 2013 financial year, which starts on July 1. Although he declined to give any sales forecasts, Mr Sim was quietly confident. In part, this was due to the lessons he learnt from following the career of Mr Steve Jobs, Apple's late co-founder and chief executive. "Keeping products simple, staying focused and having an elegant design were the three things I picked up from Jobs," he said. 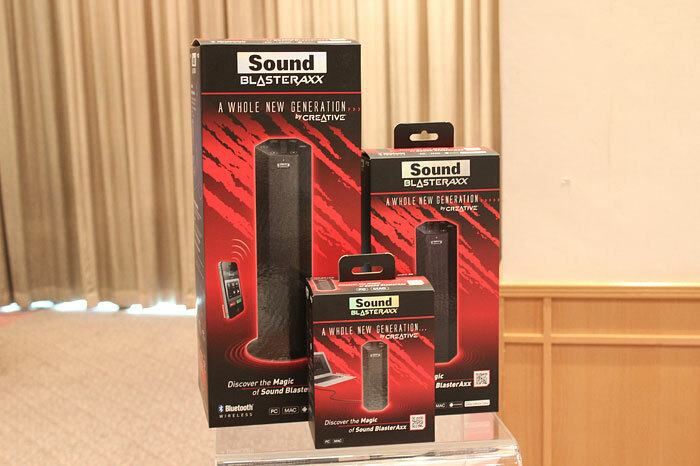 The Sound BlasterAxx comes in black, and is a hexagonal shaped device with a touchscreen control panel. To get it to work, one just has to plug in a USB cable or Bluetooth device to a phone, tablet or computer. There are no wires or power adapters. Mr Sim said he had to convince his engineers that simplicity was important. "I had to reject many features. Put them in and the cost of manufacturing goes up and it becomes too complicated to use for users." He also had to put his foot down when his engineers wanted power adaptors. He rejected this as he wanted a simple device with no wires. The gadget is powered by either batteries or a USB cable. Prices start from $129. The three new models hit retail shelves globally next month. The new gadgets will come with Creative's audio technology and built-in speakers. They provide rich and clear sound for audio playback and enhance voice communications. Unlike other speakers, they include features such as noise cancellation, voice commands and voice alteration, allowing users to change accents or sound like another person. All through the one - hour press conference, Mr Sim referred to Apple and how it keeps its products simple. "Once the Sound BlasterAxx is successful, it'll help convince the company on the need to follow the new themes. Creative's business partners at the event were optimistic on the new product. Mr Malcolm Rodrigues, co - founder of fibre broadband service provider MyRepublic, said: "For the first time, there is seamless interface to mobile and tablet devices for music, Internet telephony and movies." I hope that this time around Creative have got it right and bask in it its heyday.Better still bundle the sound blaster Axx together with the sale of HanZpad tablet. To be true portable it should have built in rechargeable batteries or at least AA/AAA bay like logitech. Lack the finishing touch. US$199. we should consider buying only if the editors here set good example. that is just a small part of jobs trilogy. pick up other lessons fast or continue to bleed red ink. so irritating.. whats a tarp?